The STS-133 stack has been checked for damage after a feeler gauge came apart during work to remove ET-137’s Ground Umbilical Carrier Plate (GUCP). The incident resulted in nine blades from the tool falling down the pad, with one becoming embedded in the tank – resulting in minor foam damage – before high winds dislodged it. Nominal pad flow processing tasks are continuing with STS-133, with the February 24 launch date continuing to be well within Discovery’s reach. Orbiter aft confidence testing is on schedule, after opening work began on Tuesday. This process will continue for the next several days. Other pad flow tasks included Pre-Aft closeout data snapshots, Water Spray Boiler Ullage inspection and Aft pyro harness Hi-Pot operations – all of which have been completed. 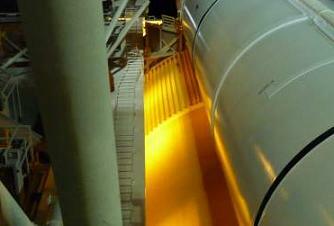 Following S0009 Pad Validation operations, the vehicle entered into S0024 Hydraulic Power Unit (HPU) hypergolic fuel loading and pressurization procedures on the twin Solid Rocket Boosters (SRBs), which has since been completed with only one minor Interim Problem Report (IPR) reported, which is set to be closed. “S0024 SRB HPU hyper load: Call-to-Stations was completed Monday morning and the pad cleared for HPU hydrazine operations,” noted the NASA Test Director (NTD) report (L2). 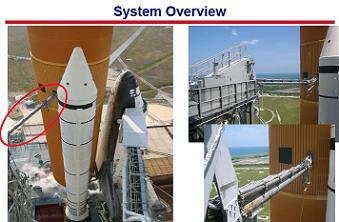 “Rock and Tilt Fuel Service Modules (FSM) have been loaded and pressurized for flight. The pad was opened for controlled work at 1815 EST Wednesday. Next on the pad flow schedule are S5009 Ordnance Installation tasks, which are planned to start Thursday evening and continue through into Friday. As reported by this site on Monday, managers decided to disassemble the GUCP after it was deemed to have failed a leak test. A small leak was noted during leak checks on Friday – although this was later understood to be noise being picked up by the detection system. 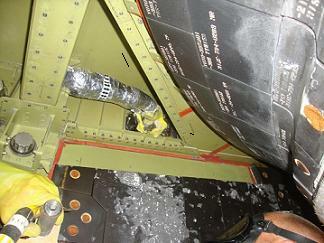 However, Monday’s helium leak checks also registered a small leak. While the leak was small enough to be classed as “in spec” – or acceptable – the decision was taken to replace the two-part flight seal on the hardware, in order to return full confidence in the system which caused the initial scrub to STS-133 back in November. Explaining the issue – which is being classed as a Problem Report (PR-34) – the NTD report noted that the de-mate of the GH2 vent line was reported to be off-nominal during the preparation for rollback to the Vehicle Assembly Building (VAB) back in December – a possible contributor to the leak once the stack was back out at the pad – before confirming the forward path to replace the flight seal. “In addition (to the off nominal vent line), during helium leak checks performed on the GUCP; a small, but in-spec leak was observed. As a result, the GUCP 7” QD (Quick Disconnect) seal will be removed and replaced. GUCP R&R (Removal and Replacement) work begins with GH2 vent line de-mate. This work will be done in-parallel with the pad integrated flow and no additional impacts are expected. 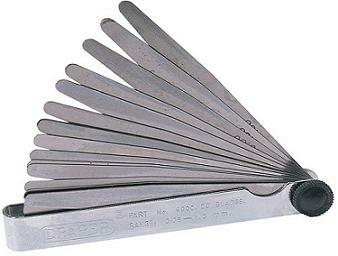 On Tuesday night, an incident involving a feeler gauge resulted in an inspection of the vehicle for damage, as nine blades from the measuring tool came loose and fell down the pad. One of the small blades from the tool embedded itself in the side of the tank – resulting in minor foam damage which won’t require any rework – while the rest missed and are all accounted for. As is standard for all work at the pad, all tools are tethered to avoid such incidents. However, the failure of the tool itself – in this case a retainer screw – caused the liberation of its parts. “While performing measurements on GUCP Pivot Assembly last night using a tethered Feeler Gauge, the gauge came apart and nine of the thirteen blades fell from the 215′ level to various levels of the FSS/RSS (Fixed and Rotating Service Structures). Recovery efforts (were) in work. Potential flight hardware damage (was) under assessment,” noted the NTD report on Wednesday morning. “Witness statements and photos were taken and walkdowns have been performed. Pieces of the gauge were found on the 155′ level, OWP (Orbiter Weather Protection), Flame Trench, and the ET/IT platform. It was also reported that a piece of the gauge was stuck in the tank, but it blew out (wind) and landed in the OMBUU (Orbiter Mid Body Umbilical Unit) area. The only other item of interest noted in the recent flow is an investigation into a loud noise that was heard at the pad during Monday’s hyper loading on the SRB Thrust Vector Control (TVC) system. “During S0024 SRB thrust vector control hydrazine system loading operations on Monday afternoon, technicians reported hearing a loud noise. The exact location of the noise was undetermined and witness statements were taken,” added the NTD report. Meanwhile, over at the Johnson Space Center (JSC), managers were set to conduct their Space Shuttle Program (SSP) Delta Flight Readiness Review (FRR) on Thursday. However, this has been delayed by one day due to poor weather near the Marshall Space Flight Center (MSFC) – which is home to a large number of the managers who’ll be involved in the FRR. The review will largely mirror the previous SSP FRR back in October of last year, along with updating the change to the launch date and the work that has been conducted on ET-137’s stringers. (Further updates and articles will follow. Refer to live coverage threads linked above. L2 members refer to STS-133 live coverage sections for internal coverage, presentations, images and and updates from engineers and managers. Images used, all via L2).